Nikodemus stared at her too long with eyes that held more than just the chill of anger. She held his gaze. Looking away first meant you were weak. It was like admitting you were less, and she never let anyone make her feel less. Not even Magellan. Nikodemus’s eyes were a fortress. Nikodemus is a warlord with a mission: Kill Magellan and his green-eyed witch at any cost. But when he meets the desperate Carson, the pull of her magic takes his breath away. 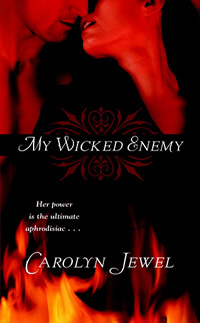 He’s not sure he can trust this tantalizing woman—she is his enemy—and less sure he can keep his hands off her. But Magellan will stop at nothing to reclaim what belongs to him. Can Nikodemus save Carson before his desire for her destroys then both? Print: No longer in print. Carson Philips is a witch on the run from unimaginable evil; straight into the arms of Nikodemus, a demon who's sworn to kill her.